Maybe you think scientists are serious people with no sense of humor? 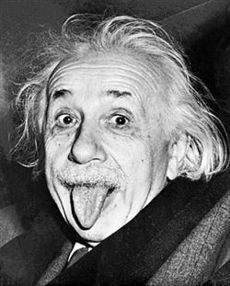 Here’s Albert Einstein, acclaimed by scientific experts and the general public alike as the giant of 20th century physics, having a bit of fun with the photographers. Einstein was a brilliant young physics professor in Germany whose theories on the physical properties of light led to a revolution in the understanding of time, space, gravity – in other words, the entire universe. For all the density of his intellectual mien, in his later years at Princeton University, where he was captured in this photograph, Einstein was also a kind of shaggy folk hero for both children and adults around the world. Sasse, Arthur. Einstein © Ullstein Bilderdienst, Berlin. Accessed 3 August 2010.